In a statement attached to the report, the school board promises to overhaul its policies governing financial oversight and recordkeeping. Money designated for the unfilled communications coordinator position was used to allocate $10,500 to Superintendent Tim Schigur, $10,000 to Director of Administrative Operations Jerry Schuetz and $10,000 to IT employee Michael Gouvion. So far, Schigur is the only one to receive full payment. The stipends were paid against the advice of the school district’s director of business services, who refused to sign the paperwork and recommended the stipends be considered by the school board. She later acted as a whistleblower by telling a school board member about her concerns, according to the report. The attorney in her report said concerns raised by Director of Business Services Mary Ellen Van Valin stemmed from her misunderstanding the source of the money for the stipends. Van Valin and Schuetz disagree on the content of conversations they had before the stipends were approved. Van Valin told the investigator Schuetz told her he didn’t want the stipends to go to the school board to avoid attention from the board and the news media. Schuetz denied to the investigator that he made that statement. Lori Lubinksy, a Madison attorney, was hired to lead the investigation into stipends given to Schigur, Schuetz and Gouvion and whether the approval process violated state law or board policy. The school board determine whether to approve Schigur’s salary increase, which was given in November without board approval. Board President Tom Westrick review all board policies and board member Brian Kvapil review the state Depart-ment of Justice’s Public Records Law manual. The board consider whether it will continue issuing stipends to employees for performing work beyond contract or job description and potentially set limits on the superintendent’s ability to use stipends when he or she deems appropriate. Administration develop protocol for use of forms used to administer the questioned stipends to prevent further confusion. Administration give all new proposed contracts, handbooks and similar documents to the school board so it can identify proposed changes, thus building trust between the board and administration. In statements provided with the report, Van Valin and Kvapil disagree with some of Lubinksy’s findings. Understanding decisions made regarding a communications coordinator position “is critical to understanding the events that unfolded starting November of 2018,” Lubinsky states in the report. The position was put in the 2018-19 budget for $41,431—a prorated amount for a full-time employee because the position would not be filled the entire year, according to the report. The school board approved the budget including the communications coordinator position Oct. 22. Schuetz was hired as the district’s communications supervisor in 2014. Since then, Schuetz’s title and job description have changed a couple of times, most recently in August when he was named the director of administrative operations as part of an administrative restructuring. The report indicates the new communications coordinator position would be separate from Schuetz’s responsibilities. The administrative team of five unnamed administrators met and discussed the communications coordinator position with duties such as maintaining social media and maintaining the district’s online presence, according to the report. In the weeks after the budget was adopted, the administrative team discussed distributing the communication coordinator’s responsibilities among existing employees rather than creating a new position. Van Valin was no longer included in bi-weekly leadership team meetings following the district’s administrative restructuring, according to the report. “Ms. Van Valin’s absence from bi-weekly administrative leadership meetings is, in the opinion of the undersigned (Lubinksy), the reason for the confusion and miscommunication concerning the source of the funds for the three stipends,” the report states. Administrators agreed Gouvion was qualified to perform some of the responsibilities identified in the communications coordinator position and that Schuetz could perform the rest, which were beyond the duties outlined in Schuetz’s and Gouvion’s job descriptions, according to the report. The director of administrative operations job description outlines communications responsibilities including coordinating the district’s strategic communication plan; being the district’s media contact; supervising communication staff; assisting with updates to the district’s website, social media and video production; and developing the district’s crisis communication plan. The report does not indicate which duties of the communications coordinator would be beyond Schuetz’s job description. Schigur determined $10,000 would be a fair amount to pay Schuetz and Gouvion each for additional duties. This would save the district more than $20,000 because the communications coordinator position was budgeted for $41,000, according to the report. The use of stipends to compensate district employees for performing work outside their job descriptions has been going on for at least 10 years, according to the report. Schigur had the authority to issue stipends to Schuetz and Gouvion because the money was allocated in the budget and board policy gives the superintendent primary responsibility of district administration, Lubinksy found. Westrick did not need to sign Schuetz’s and Gouvion’s stipends for approval, Lubinksy found. In a statement, Westrick clarified he did not approve Schuetz’s stipends but instead “acknowledged” it with his signature. At about the same time the administrative team was discussing redistributing the duties of the unfilled communications coordinator position, Westrick told Schigur the board was “tardy” in compensating Schigur for obtaining his doctorate degree, according to the report. Human Resources Director Chris Tukiendorf determined a $10,500 pay increase was appropriate based on salary comparisons against other area school districts, according to the report. Schuetz and Schigur assured Westrick there was enough money in the budget for Schigur’s pay increase because the redistribution of communications coordinator responsibilities saved more than $20,000, according to the report. Westrick believed he had the authority to approve the stipend for Schigur. In doing so, Westrick violated board policy, something he admitted to and apologized for at a board meeting Feb. 11, according to the report. The report does not indicate whether Schigur holds responsibility in accepting the payment without it being approved by the school board. The stipends made Van Valin feel “uncomfortable” because she did not know where the money was coming from, according to the report. Van Valin said Schuetz told her the stipends were not going to be presented to the board to avoid media attention. Schuetz denies he said that. He said he told Van Valin he did not believe the stipends needed to go to the board based on past practices, according to the report. Van Valin likely misinterpreted Schuetz’s comments “in light of her mindset and conclusion the stipends were not within the board approved budget,” Lubinksy wrote. Schuetz said he told Van Valin the money came from the communications coordinator position. Van Valin does not remember that being said but does not deny it might have happened, according to the report. Feeling as if she had no other option, Van Valin went to Kvapil, a board member, to divulge what she knew about the stipends. Kvapil’s statement said Van Valin reached out to him Jan. 19 and later provided him with stipend documents which he shared with the media. Kvapil violated the state’s open records law by releasing documents relating to an individual holding a public office without providing required notice and giving the individual a chance to augment the records, according to the report. Lubinsky found Kvapil violated the law unknowingly. Van Valin did not violate records law because she gave documents to Kvapil in his role as a board member, not as a private citizen. In her statement, Van Valin said she has personal concerns with the investigation and disagrees with decisions made by administrators. Van Valin believes the August administrative restructuring was “poorly done.” The restructuring gave many of her responsibilities to Schuetz. She was not given the opportunity to compete for the position of director of administrative operations because the position was never posted internally or externally, according to her statement. “My director position, prior to the reorganization, is typically valued as the ‘right hand’ position to the superintendent for many, if not most, districts,” Van Valin said. Van Valin questioned the timing of the stipends because Tukiendorf and Schuetz both had recently received pay increases with the restructuring, she said. She questioned why the three stipends did not go to the board when Schuetz and Tukiendorf’s pay increases were approved by the board a few months earlier. “This experience, as I head into retirement, has been awful,” Van Valin said. “It has been weeks of isolation, scrutiny, and my perception of unfair access to district legal counsel,” Van Valin said. Van Valin chose to retire at the end of the school year. Thursday is her last day. Kvapil said he never approached Schigur, Schuetz or Westrick about the payments before going to the media because of a lack of trust and the potential for the administrators to cover up the situation. Crews work on the area near the former Monterey Dam as a part of a shoreline restoration project Monday in Janesville. The city recently received a grant of more than $373,000 from the Wisconsin Department of Natural Resources to help pay for dam removal and restoration work. An excavator moves mud and rocks near the former location of the Monterey Dam on Monday in Janesville. A worker uses an excavator to scoop up mud Monday near the area where Janesville’s Monterey Dam used to be. The work is a part of a shoreline restoration project. Grants from the state Department of Natural Resources are paying for nearly 75 percent of the Monterey Dam removal and shoreline restoration project. The city announced earlier this month it had received another DNR grant, this one totaling more than $373,000. It joins previous grants of $400,000 and about $146,000 to bring total grant money to almost $920,000. Drax Inc. of Madison is handling the $1.27 million project. That figure includes both dam removal and shoreline restoration work, city stormwater engineer Tim Whittaker said. Drax demolished the Monterey Dam last summer. Its removal ended a lengthy fight by a vociferous opposition group to save the structure, which needed extensive repairs. Work has continued at the site ever since, though elevated Rock River levels in late summer delayed progress by several weeks. The water was too high to get much accomplished, Whittaker said. Still, the project remains on schedule for an October 2019 completion date. Crews were able to finish much of the work downstream of the Monterey Rock, close to where the dam once stood, throughout winter, he said. Whittaker called this area the “park and wetlands” portion. It will include wetlands and wooded habitats, as well as a kayak launch and four waterfront staircases for fishing. That area felt little impact from melting snow that has recently caused flooding along parts of the river. It will be finished soon depending on weather, Whittaker said. Drax crews then will head upstream near the Monterey lagoon. The bay will feature a stormwater pond, natural grasses along the shoreline, and additional kayak and fishing access points, Whittaker said. The most recent $373,000 grant helps cover aspects of the project unrelated to dam removal. Its purpose overlaps with the $146,000 grant, while the $400,000 allocation focused specifically on the dam’s demolition, he said. City officials hadn’t expected to receive the additional grant, although they were hopeful the DNR would award them the extra money, he said. The grants do not expedite the completion timeline. The project has gone mostly according to plan, and the only major challenge so far was flooding and high water from last summer, Whittaker said. He wasn’t talking about coaches or specific sports, but rather long-term planning and management. The school district’s policy, personnel and curriculum committee Monday approved hiring a full-time “coordinator of athletics, health, physical education and recreation”—a position that somewhat resembles an athletic director. The position still has to be approved by the school board and make it through this fall’s budget process. Craig and Parker high schools have part-time athletic directors, as do the three middle schools. This position would not replace those. Currently, much of the coordinator’s work is done by Scott Garner, assistant superintendent of administrative and human services. But it’s not his specialty, and it’s more of an additional duty rather than part of his job description. That’s something even Garner acknowledged. Garner and Pophal said most high schools in a district of Janesville’s size have full-time athletic directors. Athletic directors coordinate a variety of day-to-day tasks such as scheduling games and coordinating practice locations. But they also oversee coaching and physical education staff, do long-term facilities planning, deal with code issues, manage angry parents, hire coaches, and work with the Wisconsin Interscholastic Athletic Association, among other tasks. The coordinator’s job description has 35 “essential duties” that range from developing goals tied to the district’s mission to approving officials for home athletic events. The job would not officially be a director position, so the coordinator would be paid $75,000 to $90,000, Garner said. The job description requires a master’s degree in education, administration, physical education or a related field. Also required is a master’s degree in educational administration, and the coordinator must be certified by the Wisconsin Department of Public Instruction as a principal or a district administrator. It’s a privilege to do public service, but it’s arguable that only the privileged can serve. Monday, the Janesville School Board’s Policy, Personnel and Curriculum Committee decided to develop a compensation plan for board members. About 95 percent of Wisconsin’s school districts pay school board members an annual salary, a meeting stipend or both. 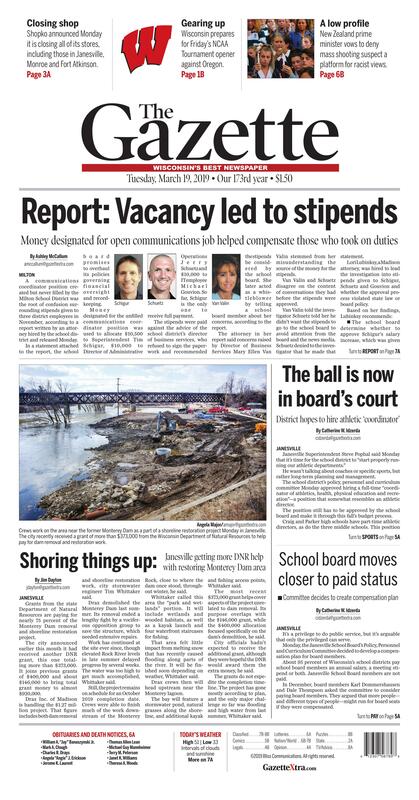 Janesville School Board members are not paid. In December, board members Karl Dommershausen and Dale Thompson asked the committee to consider paying board members. They argued that more people—and different types of people—might run for board seats if they were compensated. Dommershausen said when he has to take off work for a meeting, that’s money out of his pocket. School board Vice President Cathy Myers and Clerk Steve Huth researched the issue for Monday’s meeting. Myers spoke to school board presidents around the state about the impact of pay. Help offset the costs of child care, transportation, use of vacation time and lost wages. Encourage less wealthy and working residents to run for school board. Add value to the time commitment required of board members. Volunteering is seen as a component of public service. The community overall does not support it. It’s another expense for the school district. Board member Michelle Haworth said she would not support paying board members if the district had textbooks that were out of date and a wish list of items for students that never got filled. Board members Kevin Murray, a Janesville Fire Department retiree, and Jim Millard, who retired from the school district, agreed they would not support compensation. Myers pointed out that not everyone retires with a pension. To move forward with a plan, the full board must decide what kind of pay board members would receive. About 64 percent of boards provide an annual salary. Another 13 percent offer per-meeting stipends. About 19 percent provide both stipends and an annual salary. Board members also could refuse compensation without suffering a tax impact. In the past, that hasn’t been the case. Committee members agreed on one thing: Any pay plan should be delayed so current members would not benefit until at least the next election cycle. Compensation in the area ranges from $440 per year in the Albany School District to $18,667 per year in Madison. Thompson suggested $2,500 per member per year and $3,000 for the board president. Both numbers are below the state average and the state median. The full board would have to approve the plan for it to take effect.